The VWR Vortex Genie 2 gives users 3 levels of shaking and 8 levels of vortexing action, from a gentle low speed to a more vigorous vortexing with a range of 600-3200 RPM. This lab mixer also gives users the option of continuous shaking or touch on control, simple press the test tube into the cup to activate, then release pressure to stop. The VWR Vortex Genie 2 has a single cup head constructed of chemically resistant thermo plastic, and can accommodate nearly any test tube up to 40mm in diameter and 200 mm in length. Additional accessories are available through VWR to accommodate other flask and tube configurations needed. This lab mixer’s body is made from die cast metal and has just enough weight to keep it from walking across the counter when activated. 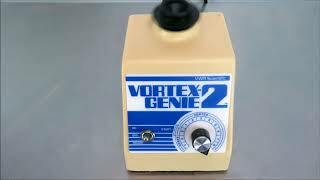 This VWR Vortex-Genie 2 G560 has been thoroughly tested and performed as expected. All of our lab equipment comes backed with our standard warranty. Should you have any questions, please don't hesitate to contact us.